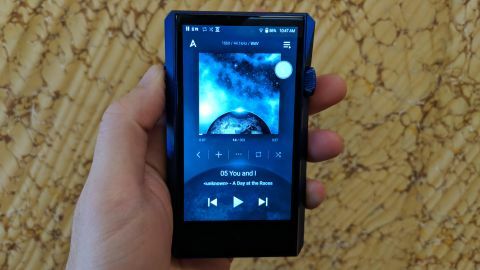 Astell & Kern A&ultima SP1000M hands-on hands on review | What Hi-Fi? Astell & Kern's new high-resolution audio player could be its most enticing yet. After listening to user feedback on the flagship A&ultima SP1000, the company has come back with a lighter, smaller model that hopes to be a little more pocket-friendly. The icing on the cake? Astell & Kern is promising better sound quality into the bargain. Well, we say bargain, at £1999, this is a serious proposition. The SP1000M is a textbook example of the Astell & Kern design. Angular lines and edges, the multi-function volume wheel prominent on the side, the shiny, all-aluminium body. It looks smart in a new Lapis Blue finish and immediately feels lighter and more comfortable in the hand than comparative hi-res music players. Astell & Kern claims to have reduced the overall product volume of the SP1000M by 18% compared to the SP1000, while the weight has been reduced by a hefty 48%. As well as the jogwheel for controlling the volume on the right-hand side, you'll find three little buttons on the left-hand side. These allow you to skip track and are almost too perfectly placed for your holding hand, so you need to get to grips with holding the device without flicking the volume or jumping tracks. On the bottom of the unit you'll see a USB Type-C connection and microSD slot, while the headphone and balanced outputs are on the top. We all know first impressions count, and first impressions of the Astell & Kern SP1000M are positive. Great sound without having to cart around a pocket-breaking hulk of a unit is certainly the right way to go in our book. So it's lighter, smaller and promising better sound. What gives? Well, that smaller chassis does mean a smaller battery. The 3,300 mAh battery promises 10 hours of playback, rather than 12 hours on the SP1000. You also get less storage space. This player has a 128GB memory rather than 256GB. You do still have the option of expanding this using a microSD card. The screen is smaller, too, offering a 4.1in HD screen versus the 5in display on its sibling, though it keeps the same resolution and the same, freshly-designed user interface. That interface does get a not insignificant update, however, with the addition of a new 'virtual back key' - a familiar idea to anyone who's used a smartphone - which should, and does, help navigation around the simple UI. Inside the CPU and DAC are the same. So that means two AK4497EQ DACs, one for each stereo channel, and an Exynos 7420 octa-core CPU. What is new is an upgraded audio block layout, which aims to move the capacitors, shorten the signal path and deliver better sound thanks to reduced noise and improved output level. Elsewhere you can expect support for 32-bit/384kHz high-resolution PCM audio and native playback of DSD audio, up to quad-rate (DSD256), plus Wi-Fi connectivity, USB DAC functionality, DLNA networking, digital audio output via USB and apt X HD Bluetooth. Also new is an open app service, allowing app developers to use the A&K API to enable direct loading of apps on the player. Eleven music services are supported at launch worldwide, with four of them supported in all markets - Amazon Music, Soundcloud, Spotify and Tidal. There's no Qobuz support for now. The SP1000M also has Tidal embedded as standard. What's the difference? It seems for full functionality - such as offline playback on Tidal - you need to load the apps on rather than having them embedded. We look forward to exploring this more in our full review. Smaller, lighter, better sound: that's the promise. One thing's for sure, it's hard to be disappointed in the way the SP1000M sounds in isolation. Listening through a pair of Audeze headphones - which seem far heavier than the player - vocals sound spacious and immediate, with impressive breadth to every note. Metallica's Enter Sandman sounds powerful and punchy, and cranking up the volume lets you hear more of the grunt in the vocals and dynamics in the guitar, without adding any harshness to the treble or sounding over-cooked. Something a little more sedate, Joni Mitchell's Blue, shows the SP1000M perfectly comfortable showing a more careful hand, adept at giving vocals room to breathe and keeping a hold on timing so the pieces of the track still come together. A product launch event is never the best time to draw serious conclusions on a new product, especially a high-end device such as this, but our first impressions are certainly positive. Lighter and smaller can only be better for most of us when it comes to portable devices and if Astell & Kern can deliver the level of performance we're used to, we could be in for a treat. But with that £1999/$2400 price tag, it of course needs to sound very good indeed. We look forward to hearing the SP1000M in more detail in our dedicated test rooms, and indeed pitting it against rivals – if we can find any. Based on Astell & Kern's recent efforts, we have high hopes.